Finally a warm sunny day! Today I worked outside and it was wonderful. The time frame between the cold season and bug season is short but ideal. One doesn't waste beautiful days during this season doing inside chores. 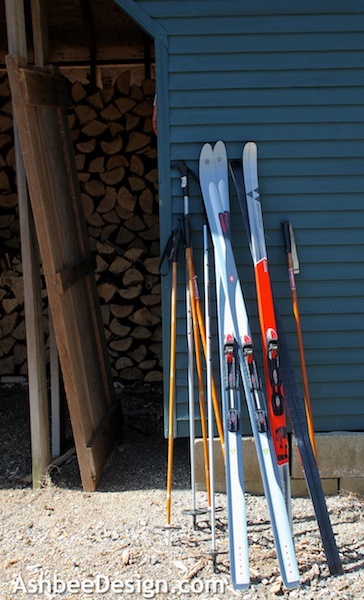 I started by packing away the cross-country skis. I don't plan on using those again for many months! And then I tackled the driveway entrance. 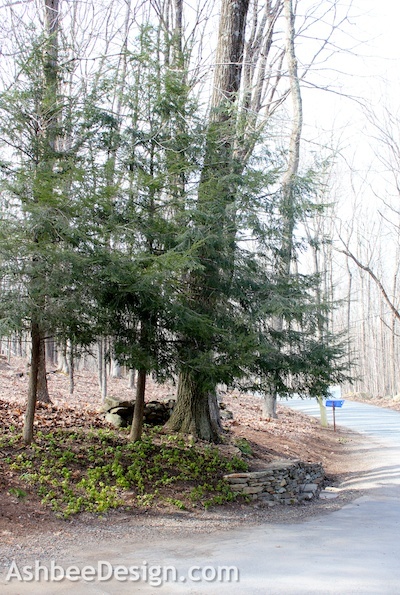 Our driveway is about 400 feet long and the entry is carved into the slope of the hill. 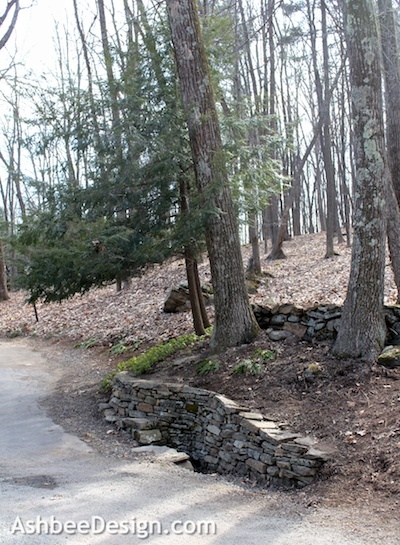 I had built some stone walls out there a couple years back and the area just need some general cleaning. I raked out all the leaves, pulled all the emerging prickers, and clipped all the little brush shoots. Then I cleaned out the pachysandra as well. This batch has been slow to establish itself. I expect it doesn't like being under the hemlock trees. Those trees were planted by me while I was pregnant for my first daughter. They are 33 years old! For several days last week David and I spent our walk time clearing out the bottom branches of the pine grove. Looking up the hill is now an entirely different view. 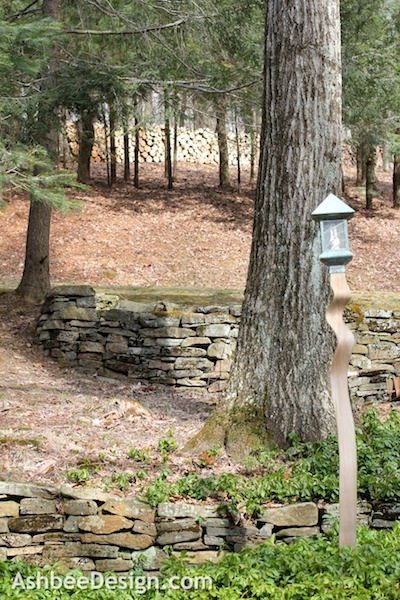 You can see our wood pile. That is next year's heat stacked up there. David has started working on filling the woodshed again. That is another job that is so much easier if you get it done while the weather is still cool. And a not so welcome sign of spring as well. As I am sitting here typing this I feel an unwelcome slight tickle. I glance down at my arm and sure enough. The first deer tick of the season is waltzing along it. Time for a shower and clean clothes! Hope you got that naughty deer tick and found out where it came from. Not in your house are they? Hope not. Your property is so beautiful. That's quite a wood pile. Need that when it's really cold and yes it is a great idea to get it all piled up before it gets hot again. We had a fire place in our mfg. home in MT on 20 acres. Know how it is to have to watch for those ticks. We had moved to MT from San Diego area so I was really a city slicker. Had to learn how to live and educate myself about totally different way of life. I loved it but it was a bit of a culture shock. Wish we could move back and have what we had then. We've lived in KY since (really have to watch for bugs there) and now in western CO. Of all the places we've lived I still love MT best. We lived close to the shore of Canyon Ferry Lake on our 20 acres. Breath taking. The deer ticks are a real problem around here because they are so tiny and their bite can have Lyme disease. We are always on the alert once the season starts. Sounds like you have lived in some interesting places. We have been on the same spot for 35 years. Longevity allows you to tackle long term project though.